Video credits to -Robert Eisbrenner. The video got somehow mirrored in our upload to facebook, we are working on a fix.Please check out original video on you tube. As more and more people are becoming aware of the secret covert Geoengineering programs happening in their skies above their heads, the public has become more suspicious about the persistent jet exhaust trails that they are seeing.These trails are not like normal contrails that disappear with in 30 seconds like the wake behind a boat.These jet trails are not contrails, or vapor trails.They are made from toxic metals and man made chemicals that will persist, and block the sunlight.Usually these trails will spread out and last hours or most of the day, but that is not always the case.Now they have new spraying formulas that can dissipate much faster before they are recognized by even the most seasoned researcher. In a attempt to make it difficult to recognize these chemtrails in the sky for even the well trained chemtrail geoengineering activist, “THEY “have changed the way geoengineering chemtrails look to the public. The CIA FBI NSA and all the other alphabet groups have been busy keeping the public and chemtrail activist busy arguing about weather these are contrails or chemtrails, while “THEY” themselves on the other hand have already actively changed their spraying patterns and tactics around the globe. 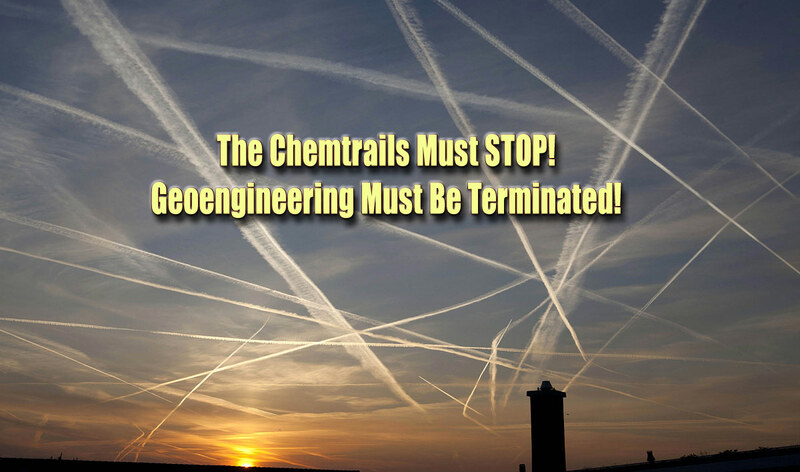 Nowadays we see airplanes that are spraying on and off to create more cloud like patterns instead of easy detectable lines in the sky that go from horizon to horizon, or other well known patterns such as grid patterns. “THEY” have switched to improved chemical combinations that will disperse much quicker than ever before. They are very fast dispersing contrail like formulas that spread quickly and get wider into a “white haze within seconds” to just a few minutes instead of hours to covert the sky, while these man made chemical clouds block the sun for over 20 hours. BUT THAT’S NOT ALL THAT IS OUT THERE NOW !!! – NOW `THEY` HAVE STARTED TO RAVERAGE OUR SKY WITH A NEW AND LURID INVENTION CALLED – CHEMBOMBS !!! They were first noticed about 2 to 3 years ago and are now common in almost every country. Chembombs are aerial aerosol explosions that disperse massive amounts of chemicals into the stratosphere being launched either from ships, land or disbursed by planes. The explosion creates a massive artificial chemcloud cover (chemical clouds) over huge areas in a very short period of time and thus making it more difficult to detect the fingerprints of the culprits as all we see is the hazy whitened out sky full of artificial chemclouds that seem to appear floating in out oft the blue. But the Chembombs don’t go undetected as their explosion patterns can be seen on infrared satellite and Google Earth images. This heinous technology is used on global scale as satellite images are proofing and is modifying weather pattern and causing extreme weather events beyond imagination. The video above and the pictures are the first hand evidence of this new Geoengineering technique in action. The pictures show the same incident that occurred on 27.07.2013 in Germany but from more close location ( Germany – Auerstädt ) Between 8-9 pm a Chembomb was launched at low altitude and this was witnessed by many people. It all started off with very bright shining clouds that were building up on each other and forming the center of these artificial cloud system that very quickly expanded upward and spread outward in a perfect circle. An airplane was reported to be flying within that formation as well as in and out of it. The artificial system quickly expanded and was reported by eyewitness to have moved into north east direction due to the wind. Satellite images that are available for this region one hour later clearly show the chembomb as it had moved north east direction. Image shows also a second chemcloud formation. This second one can be seen how its starts forming out of very bright clouds on right hand side of video above at Min: 0:20 and 1:00 also. More Evidence – Pictures of the event can be found here..
Watch more on this subject..
VISIT US FOR THE FACTS ON GEOENGINEERING !